SOUTH PASADENA, CA — Not regularly showing films since August, the Rialto Theater will supposedly show “Rocky Horror Picture Show” this Saturday evening. No information on specific time or admission prices. Announcement provided by the Los Angeles Conservancy’s Modern Committee. Supposedly? Where’s the text of the announcement? I can’t speak for this Saturday, but if you are in the wonderfully over-priced and over-rated city of South Pasadena, stop by the Rialto for “Eddie G’s Birthday Bash” on December 28th. It’s on the marquee. P.S. The building is definitely on the market. I was hoping someone else more in the know could shed some light on it. I was just emailed saying they were showing the movie there this Saturday. Without any specific information I didn’t want it to appear as definite. The Farewell Performance of Rocky Horror at the Rialto. After this one, it’s all over. Don’t miss it. We will finish 30 years of Rocky Horror at the historic Rialto Theater this weekend. Tickets are $13 general admission, and $10 for all in costume. Cash only. Commemorative T-shirts, Programs, Tickets, and more will be available on limited basis. Currently gathering Rocky Vendors. Email DEVO for vendor reservations. Alumni should contact DEVO for casting also. Come find out who will retire and who will not. 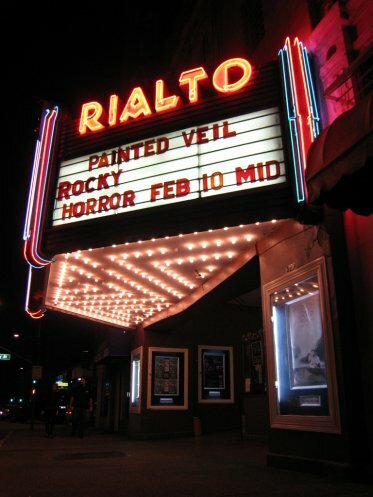 In August of 2007, with no notice, the Rialto theater in South Pasadena was completely shut down. The cast of Dark Refrain, on the verge of completing 30 continuous years of Rocky Horror in the theater, wasn’t even allowed one last show. THIS COMING SATURDAY, December 29th, Dark Refrain has booked a FINAL FAREWELL PERFORMANCE OF THE ROCKY HORROR PICTURE SHOW at the Rialto. After this, the theater will probably close its doors for years. This Rocky Horror performance comes on the final weekend of 2007; Rocky Horror was shown for the first time in the Rialto on the first Saturday of 1978. We now complete our thirty years, and we close our theater and our show with glory. The Saturday, December 29th show will be an epic night, and should NOT BE MISSED. An all-star lineup from all three casts that have shared the Rialto will perform, representing Voyeuristic Intention, Rocky’s Whores, and Dark Refrain. Expect an hour’s worth of outstanding pre-show acts from professional entertainers and supporting Rocky casts. Box office opens at 10PM, doors at 11PM, Preshows start at midnight. Tickets $13, $10 in costume. The Rialto, a magnificent 1925 movie palace built to seat 1200, is decorated with golden buddhas, a glowing-eyed gargoyle over the stage, and stunning architectural detail. This was one of the last 1920s movie palaces open to the public for films, and with its full stage, orchestra pit, flyhouse, organ loft and balcony, it is the ULTIMATE ROCKY HORROR VENUE. If you haven’t seen our show there, this is your last chance. This may well mark the retirement of Dark Refrain and the final Rocky performance in South Pasadena. DO NOT MISS THIS OUTSTANDING, ONE-NIGHT-ONLY EVENT. I’m guessing if you had the FUNDS (yes, lots of funds! not just ideas, but funds!) to restore the Rialto, you’d have more than a “hotmail” email account, and probably would realize more effective ways to find the owner (realtor, etc) than to blog comment here. Yes, he’s the trustee for the owner. The LA Times reporter who interviewed him might perhaps give you contact info. However, even if you had hundreds of thousands of dollars to “invest” in the chairs, carpets, paint, or perhaps millions depending on heat, air conditioning, electrical, plumbing, etc, what would you do with the Rialto? FORGET daily movies- nobody is going to be in the black there doing that in a one theater, one screen house. This place needs an org like Amaerican Cinemateque to step in… Minus the butchering (ie Egytpian) of course. With a 1200 seat capacity for one auditorium, it is too big for daily movies in its location. AFI doesn’t operate auditoriums that big. It needs live shows (and a film series like the Alex, the Warner Grand, etc). Gee whiz, Howard – way to be extra-encouraging. Sorry if I didn’t sound encouraging, but good intentions and encouragement won’t reopen the Rialto. It will take a lot of cash, and probably the involvement of a community based nonprofit, or an experienced operator of other theaters. I DO wish to see the Rialto restored and reopened for entertainment. We ALL want to see the Rilato re-opened and, of course, restored. I am hoping it can be converted into multi-use and not just for rentals for so and so’s “Sweet Sixteen Party.” So, cheers “Rialto Saver” – good luck and I hope you can make a go of it. At least you’re trying which is more then can be said for the City of South Pasadena. You may wish to contact the city or maybe whoever is in charge of designating the Rialto a historic building, or perhaps Landmark Corporation in the hopes that they may have the info you need and again good luck – and thank you.